GENERAL INFORMATION The Atlantic Region is found on the east coast of Canada. It includes Nova Scotia, Prince Edward Island, New Brunswick, Newfoundland and Labrador, and the Gaspé region of Québec. The land is characterized by low mountains and plains. The climate is cool and wet, with a hurricane tendency in the summer and early fall. The area was once covered with lakes, which left behind good soil for farming. Farms in this area produce potatoes, milk, apples, and maple sugar. The forests are mixed – aspen, maple, ash, spruce, pine, and hemlock all grow in the region. The forests are used for pulp and pa per production and lumber. Coal and oil are found in the region. The area is home to some of Canada’ s best fishing. MORE INFORMATION The final physical region of Canada if you travel from the west coast to the east coast is called the Appalachian Highlands, which is another name for the Atlantic Region. It may be the last of our physical regions discussed but it was the first physical regions that was re-discovered and inhabited by the early European settlers. 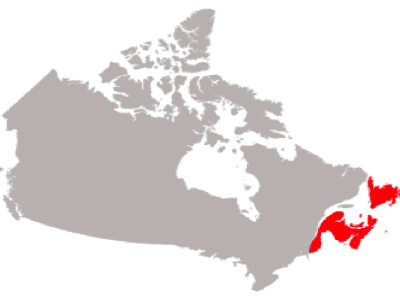 The area is located in all of the 4 maritime provinces (New Brunswick, Nova Scotia, Prince Edward Island, and Newfoundland and Labrador) as well as, the majority of the area known as the Gaspé Peninsula in Quebec, often referred to as the " Thumb of Quebec". The coastal climate varies throughout this region, but generally the further east you go, the warmer it gets. These areas are higher than the St. Lawrence, Great Lakes Lowlands (or region). The reason is because this area was a mountain range that formed millions and millions of years ago. Erosion and the movement of glacial ice wore these mountains down until what is left is an area full of rocks, many trees, rich soil, many lakes and coastal inlets. All of these wonderful resources add to the economy and development of the Atlantic Region. Water is truly plentiful in this region which includes the Gulf of St. Lawrence, as well, as the Canadian coastal waters of the Atlantic Ocean. Water always means tourism, as well, as transportation such as shipping industry, and hydroelectricity. Moreover, in this area of Canada, water also means the fishing industry. 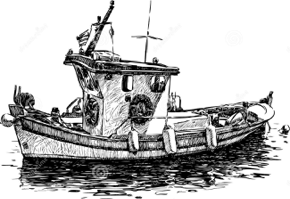 The fishing industry has a rich heritage in the maritime provinces. 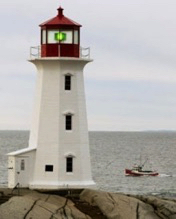 Canadians have been fishing the Grand Banks since John Cabot's discovery in 1497. Cod, halibut, herring , flounder, mackerel, lobster, scallops, sole, crab, shrimp and mussels are just waiting for you to sample. Unfortunately, since we've been over-fishing these areas since 1497, we've run into some problems of endangered species. The cod fish were nearly wiped out. Many fishermen had to get another job or else move away when they started to lose fish species. This, unfortunately, is an excellent example for all Canadians to observe. Our abundant resources found in the 6 physical regions will not last forever. We must all be careful. The Rocks of the Appalachian Highlands provide minerals for Canadians to mine. Iron, zinc, and gold are a few of the minerals utilized and mined in the Atlantic Region. The trees of this regions are important to tourism/recreation industry (hiking, camping) etc., as well as, they are used to produce pulp and paper. Most of the pulp eventually becomes our daily newspapers. Oil has been discovered under the ocean floor here. The Hibernia oil field has helped boost the sagging economy of Newfoundland and Labrador because many out of work fishermen can go and work on the floating oil derricks found out in the ocean. As we said before, there is also rich fertile soil found in some parts of this regions. The agricultural industry isn't as large here as in other regions in Canada, but livestock dairy, vegetables (PEI - potatoes), fruits (Nova Scotia - blueberries and apples), and some grains are produced and exported to other parts of Canada, as well as, around the world. The rich historical heritage and the maritime hospitality, traditions and cultures allow for the tourism industry to thrive. 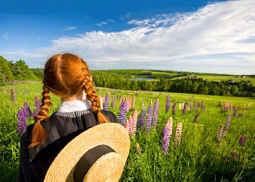 Have you read the book or seen the movie of " Anne of Green Gables" by LM Montgomery? Well, the entire setting celebrates the beauty of the Appalachian Highlands. It is worth the read! New Brunswick, Nova Scotia, Prince Edward Island and Newfoundland are the smallest Canadian provinces, and were the first to be settled by Europeans. Evidence of contact as far back as AD 1000 has been found at a Norse settlement at l'Anse aux Meadows, in Newfoundland. The Grand Banks have been called the "wheat fields" of Newfoundland. This hallow continental shelf extends 400 km off the east coast, where the mixing of ocean currents has created one of the richest fishing grounds in the world. Once thought to contain a virtually inexhaustible supply of fish, the Banks are now considered a vulnerable resource that must be wisely managed. The Atlantic provinces are an extension of the Appalachians, an ancient mountain range. Much of the region has low, rugged hills and plateaus, and a deeply indented coastline. Agriculture flourishes in the fertile valleys, such as the Saint John River Valley, New Brunswick, and the Annapolis Valley, Nova Scotia. 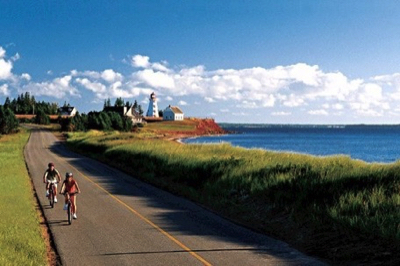 Prince Edward Island in the Gulf of St. Lawrence has a gently rolling landscape with a rich, red soil. This fertile island is Canada's smallest province, making up a mere 0.1 percent of Canada's land mass.